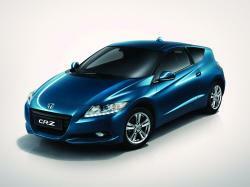 Correct Wheel Sizes, PCD, Offset, Rims and Tire specs for Honda CR-Z series. I have a 2014 Honda CR-z, will 18x8 rims with 48 offset with 205/40/18 tires fit? Hi,Britney,yes,it can fit for your car. Hi, john harrison,no,it can not fit for your car.try 5*114.3. Hi, Can I put 19'' wheels on my 2015 crz. Thank You. can I fit 9j rears and 8j fronts with 35 offset to my 2011 crz?